Last Friday evening/ early Saturday morning, I started not feeling the best. Felt like I was coming down with something. A cold. Sinus infection. Bronchitis. Something. Unfortunately, I am one of “those” who are “always” sick. Or so it seems. I used to get pneumonia as a kid and now, like clockwork, I get bronchitis at least twice a year, if not more and most often, at least one sinus infection. Last year, I ended up with Influenza. It took me down for what felt like forever, although it was really, “only” about two weeks. All I did was sleep. It was so not fun! And I wouldn’t wish it on my worst enemy. Since then, however, I haven’t done a lick of anything – no running, no biking, no yoga, nothing. I have been fueling up on orange juice and lots of other liquids – I even had one hot brandy (that’s what my mom drinks when she’s feeling ill!). I’ve been dining on chicken noodle soup and other make-me-feel-better-but-maybe-not-as-healthy foods. And, I have been taking Alka Seltzer Plus every day. Both my husband and I use this stuff when we have colds and it seems to works like magic. I have been trying to get as much sleep as possible. I’ve even taken naps, which I. Don’t. Do. With that being said, as much as I have wanted to get out and run, I haven’t. I’ve wanted to. I even almost did today, but I listened to my body. Instead of lacing up my shoes, I took a two-hour nap. And, it felt GREAT. I do feel like I am starting to get better, but I know I am not 100 percent yet and I know if I would get out there and run, it could set me back and I don’t want that. I am going to go to hot yoga tonight because I feel like that would help. I have no plans to run tomorrow, but I am going to run on Saturday. I have to. How the heck did that happen? Twenty-four days? That is less than a month. I was feeling prepared. Until this week. Until this stupid cold thing I’ve got going on. Stupid germs. Stupid cold. Stupid sickness. I will run on Saturday and hopefully get back into the swing of things. 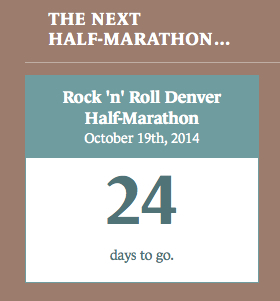 I know I can do the half-marathon. I’ve done three before. The first one with minimal training. The second two with pretty good training. The training for this one has been going mediocre. I’ve done several longer runs – 10-11 miles. I know this coming Thursday, a week from today, I have a 12-miler to do. I guess we’ll see how that goes. For now, I will keep listening to my body – fueling up on liquids and getting plenty of rest! My heart and head are telling me to get out and run, but I have to listen to my body. It’s not something we like to do, but sometimes, we have do what we have to do! Previous Previous post: 21 years! Next Next post: A little of this and a little of that!